John Mulvihill spent five years in Ireland. 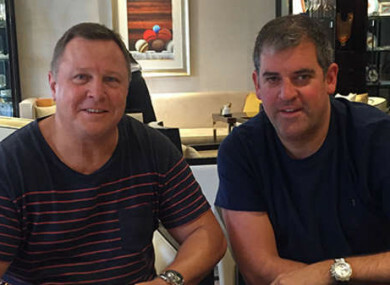 Mulvihill (left) with Cardiff Blues chief executive Richard Holland. JOHN MULVIHILL, RESPONSIBLE for mentoring Australian stars such as Matt Giteau and David Pocock, has been appointed Cardiff Blues head coach from next season. The 51-year-old, who started his coaching career with Navan RFC in the late 90s, is leaving his role as assistant coach with second tier Japanese side Honda Heat. He has signed a three-year contract with the Guinness Pro14 side. Mulvihill, who also had a spell as interim head coach of Western Force, fills the vacancy which will be left by Danny Wilson, who has accepted a role as assistant coach at Premiership side Wasps. “A new beginning brings fresh ideas and a new approach that will assist the playing group to reach their full potential both as individuals and as a collective group,” said Mulvihill. Mulvihill was appointed as player/coach of Navan in 1998/99 having captained Queensland and represented Australia at U21 level as a player. Alongside director of rugby Jim Hartnett, the two Aussies oversaw a lean period in Navan’s history, with the club winning the Town’s Cup in 2000 and the Leinster League Division 1 in 2001. After five seasons in Ireland, Mulvihill returned home to become assistant coach of Super Rugby outfit Western Force. Blues chief executive Richard Holland said the Australian would be ideal for the club as he is a master at identifying young talent and nurturing them. “John will be the perfect fit,” said Holland. Giteau, who won 103 caps and played a key role in Australia reaching the 2015 World Cup final, gave Mulvihill a ringing endorsement having played under him at Western Force. “Throughout my time at the Western Force I was coached by John Mulvihill for three years,” Giteau told the Blues website. “During that time, I found his coaching second to none. “For me as a ball player, he offered constant feedback, clear game plans and added a real creative edge to my game. Email “Australian who started career with Navan RFC appointed Cardiff Blues head coach ”. Feedback on “Australian who started career with Navan RFC appointed Cardiff Blues head coach ”.